Everyone knows about the famous act of heroism of the Imperial Dragoons at the bridgehead on the Dnjestr. The advanced posts held out against countless attacks, defying enormous numerical superiority, until the masses of the enemy were finally able, after monhs of intense action, to conquer the redoubt, which had in the meantime been reduced to rubble. The remaining handful of Imperial Dragoons, led by their commander, Colonel Planckh, were nevertheless able to retreat through the enemy ranks, and reached our lines. The Viennese audience today welcomed the heroes of Uszieczko on the stage of the Bürgertheater with a stormy ovation. The splendid idea of celebrating the heroes of Uszieczko was the inspiration for the scenic prologue which the sensitive local poet Irma v. Höfer wrote for the occasion. She set the scene in the location of the fierce battles, and the painter Ferdinand Moser conjured up the landscape on the Dnjestr, on the stage, with sleight of hand. The Imperial Dragoons are encamped in front of the defensive emplacements, behind which the Dnjestr meanders like a silver thread in the twilight of the moon, and most of those who appeared on the stage this evening were actively engaged until recently in the terrible struggle on the Dnjestr. Most of them were wearing their well-earned campaign medals. Hofburg actor Skoda interpreted Irma v. Höfer’s profound and fascinating prologue, in the uniform of an officer of the Dragoons. He spoke of the glory of the Imperial Dragoons, of the heroic deeds of the 11th, of their endurance of all attacks. He was filled with rousing enthusiasm, and deeply moved. While the Imperial Dragoon waits in the dawn for the enemy to attack, he thinks of his home, his mother, his wife and children, he strokes and kisses the last postcard from his loved ones, and goes to face the enemy. Irma v. Höfer’s prologue is a poetic, elegant portrayal of the final heroics of the Imperial Dragoons, and sketches the history of the glorious regiment. After the glowing speech of the officer, which Herr Skoda declaimed beautifully, with rhetorical elan and dramatic climaxes, the new regimental anthem, with the encouraging text by Mrs. Cavalry Captain Elma Perovic, was sung by Cavalry Captain Zamorsky, one of the heroes of Uszieczko. Then the forms of the Commanders-in-Chief and commanding officers of the famous regiment, Colonel Heissler, Prince Eugene, Radetzky, and, finally, our Kaiser, were paraded. The regimental trumpeter played, “Let Us To Pray”. The soldiers on the stage knelt down and sang a popular hymn, accompanied by the audience, which included, apart from the top military brass, the highest ranks of the civil service, and representatives of the most exclusive social circles. This performance of Frau v. Höfer’s prologue, which brought the events of recent days to the stage tangibly, with vitality, was greeted by the most enthusiastic applause. There were several curtain calls, and the packed house acclaimed the heroes, who saluted their thanks. Irma v. Höfer received a standing ovation, and the wish was widely expressed that the work be made available to the widest circles, in further performances. The scenic prologue was followed by a performance of Eysler‘s Woman-Eater, with Fritz Werner and Betty Myra in their well-known starring roles. All that took place in Vienna on 28th April 1916. Give that day back, it’s incredible! I must be making it up, exaggerating, exercising my deplorable tendency to see peaks everywhere, and to draw straight lines between birth and demise. It is incredible. It was just as a vision before my eyes of the most terrible things, that could only be imagined in the collapse of human dignity of these times. It can’t actually have happened! However deep it wants to go, it can’t, because even chaos has rules. Give that day back, it is not true! The seriousness of this dead season is bloody, and its boredom heavy as lead. But that survivors fought their way back through the enemy to our lines, to our terrible rows of seats in our theatre, the survivors fought their way through to a theatrical presentation. Good God in heaven, punish my disbelief with hell fire: I don’t believe it! Combatants, even high-ranking ones, the very highest, tell me that they don’t believe it. They say I made it up. And whether I didn’t realize that? I don’t know anything any more. It has all happened so quickly. Everything that I accused the times of has come so true that I have lost my overview. But I think that if I am allowed to swear an oath, the hand with which I swear is my hand, so yes, I made it up. But the day can’t conjure up such a headlong dive into the abyss without the encouragement of the devil, and the devil can’t do it without the help of black magic. I just whisper the things into his ear that happen to occur to me, as if they were going to tear my mind apart: that I think that there is a causal relationship between blood and gain. Per thousand casualties there is one who had athlete’s foot, and so was able to buy himself a palace, and because he delivered, knowing where to, but not knowing where from, is entitled to sit in an automobile, while Duchesses take their place on the running board of a side-car. People tell me there is no causal relationship, and I say that one should already have seen the causal relationship, and however unavoidable, and welcome, the sacrifice, one must decide to forego all sacrifices, and perhaps not even die, if such riches are the result. But I am not prepared to abandon causality, because here and there I come across the root of the unbound mechanism, just that there it is comforted and tempted by ideology, and here speaks the honest language of profiteering. But I don’t believe this one, last thing: that that there was performed by these here! In the cinema, I could just about believe it, but not in the theatre! You mean they escaped from the guns, just to set themselves up in front of opera glasses? So the soul consumes itself when it is hungry? No, that is the work of the devil, and he got it from me. Someone said it did happen, but they were from the staff. Impossible, I said, more than impossible, because if it were the case, the first glance at the report… but didn’t I just make that up? As I dreamt of Irma von Höfer or of Jarzebecka, and about everything which down here, each in its own way, is in service of glory, and suddenly about the humiliating situation in which the victorious front was abandoned to those behind the lines, and to save itself from them had to salute, and was then embraced by them under misuse of the Red Cross flag and more. I was feverish, and the doctor wrote a prescription and I wrote the report. But then I read it in the newspaper, how did that happen? Let us just assume that the report is only a report. Time is enchanted in the newspaper, and is incapable of such things in real life. But it becomes capable, bit by bit, during the report. The first glance is still optimistic: Skoda is an actor, and is enthusiastically received. He sets off all the bombs. They were actors, playing the roles of heroes. That happens every day, it draws the crowds. It is an obscenity before God, but theatre is not made for God, it is made for the audience. It is a nice thought. Suddenly, the report reveals that it was the heroes themselves who had played the heroes, they were born to play heroes. How naturally the audience greets the brave defenders of Uszieczko today, after having greeted and enthusiastically applauded, for example, the heroes of Isonzo at the last premiere. But if they were neither extras nor the heroes themselves, but something else again, soldiers playing soldiers, comrades from the same regiment, who were on the stage for them, and applauded, then it was both, they had to play what they have not yet experienced, portray what the others had done, and then the soldiers were made up, and their accolades were well-earned stage props. They didn’t act how they had stroked and kissed the last postcard from the loved ones, up there on the Dnjestr, before going to face the enemy, they acted how they would do it if it came to it. Which of these mental images strikes us more icily, this one or the other? One who was not there, and didn’t read about it, but only heard that it had been written that it had happened, said that the blood which he was willing to spill for the fatherland froze in his veins, he couldn’t go on. But one who was there said he can’t yet decide whether they were heroes, soldiers, or just extras who may also in their turn end up in the situation. He believes that they were phantoms, sent into these times from my dream, and now condemned to lie for a while here and there in the dawn on the Dnjestr, until the sun breaks the spell. But however it is to be interpreted, he is now living in this transition, and as those up there knelt down to pray before the audience, and as those up there saluted, and the vermin down below cheered them and sang patriotic songs, and stood there side by side in their top hats and tails, it struck him as the most terrible of all contrasts, like an infernal battle between the glory of God and the arguments of the devil, and the anguish for a delirious humanity, mocking its own sacrifice. He doesn’t know any more what happened, it was panic. But this much he remembered, that Fritz Werner, who was certainly not a soldier, and enjoyed great success everywhere, except for at Uszieczko (Oh, dear, the spheres are overlapping!) appeared this time as an Ulan in the Woman-Eater, instead of, as usual, as a dragoon, in honour of this cast. Skoda too excelled himself and got a huge reception, he is, of course, a court actor. Nobody can be sure, but all external borders are sealed, and all the internal ones open, and so there is no escape, because if there are already problems at the border escaping after the Advent Ball, the internal path gets lost in infinity. The two things are connected. Where can one hide from this freedom? The emergency exit into one’s own soul is blocked! Patronage is impossible because there is a war on. One cannot find the way to oneself, but everything outside flows into and across each other. The term Vorstellung has been condemned to a tragic ambiguity by the times, oh, all ideas (Vorstellung) are welcome! But it has gained unimaginable (unvorstellbar) new significance. The whole thing is just a performance (Vorstellung) to be reviewed. The joke that the battle does not start until Ganghofer arrives, is no longer original, it is the bitter daily truth, the most bitter truth that the world could impose on its suffering humanity. But now it has gone even further, the reporter sits, as he used to do, in the stalls, the front has taken the stage, the heroes take the stage. War was a performance for which they, the critics and authors of the play together, had free tickets, as usual, with the bonus of not having to take part. But now the war has changed its battlefield, the mountain has come to Mahomet, and the theatre critic writes the battle dispatches. The packed house acclaimed the heroes, who saluted their thanks. The wish was widely expressed that the work of the deepest sensitivity be made available to the widest circles, and that the fallen should come back to life, kneel down, and salute the hyenas, who want it that way, and would have to go hungry if nobody died. No, no, no! It can’t be true! Give me that day back! It was my birthday. Today I turn 42, and step back into the very last rank of the reserves, but who knows? Perhaps I will still lie as a hero on the stage of the war theatre, the battlefield of the Bürgertheater. But I won’t write about it. I can‘t. I will take part, when everyone who can’t write about it has to. No one can write about it. It just happened to us. My spirit feels the humiliation of humanity. It was done to it, not to me. What happened on 28th April 1916 would mean, if it indeed happened, that we have become used to accepting the monstrous, without a single tear in our eye, but when we were expected to cry once, we looked through opera glasses. But it didn’t happen! It was a fata morgana on my way through the desert. It was a birthday present. I was supposed to be surprised. One made me a present of the image of the most unimaginable that the times had to offer. Performance, and idea. There is no English word which carries these two meanings. It is a central term in Schopenhauer’s philosophy, and difficult to translate. 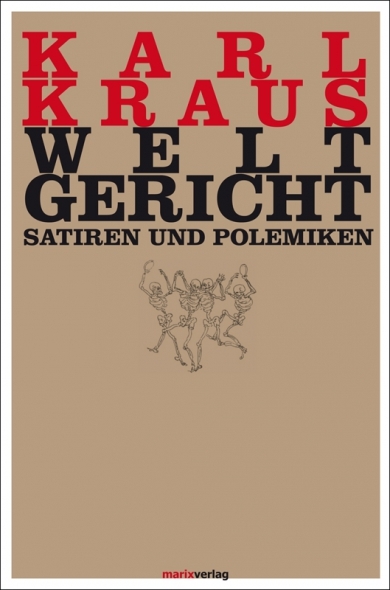 This entry was posted in 1916, Karl Kraus. Bookmark the permalink.